Sweets Dreams is a pay haunt located in Alsip (inside of the Fun Time Square amusement center). The Tourers have been going to this haunt for several years now, and unfortunately it is also a good example of a haunt that has increased in hype and in price over the years, but unfortunately not in quality. It's web site describes it as having "more scares per square foot than most attractions", but unless "scares" equals "empty space" we really don't see how this can be the case. When we first visited this haunt it was reasonably priced (under $10) and had some decent scares. Although the haunt was short, it was still interesting enough to keep us coming back. However, price increases in the past couple of years and the lack of any significant improvement in the haunt have really diminished our interest. In 2011, the haunt was only about 5 minutes long (without exaggeration) and the short length simply didn't justify the price. Thus, we were determined not to go in 2012. However, the web site pointed out that the haunt was under new management and had been expanded for 2012, and since it was on the way to other haunts in the area, we thought we'd give it one more shot. While it is true the haunt was expanded, unfortunately the "expansion" consisted of a large dark maze with no scenes an only one actor, which amounted to 5 extra minutes of simply wandering towards the exit. 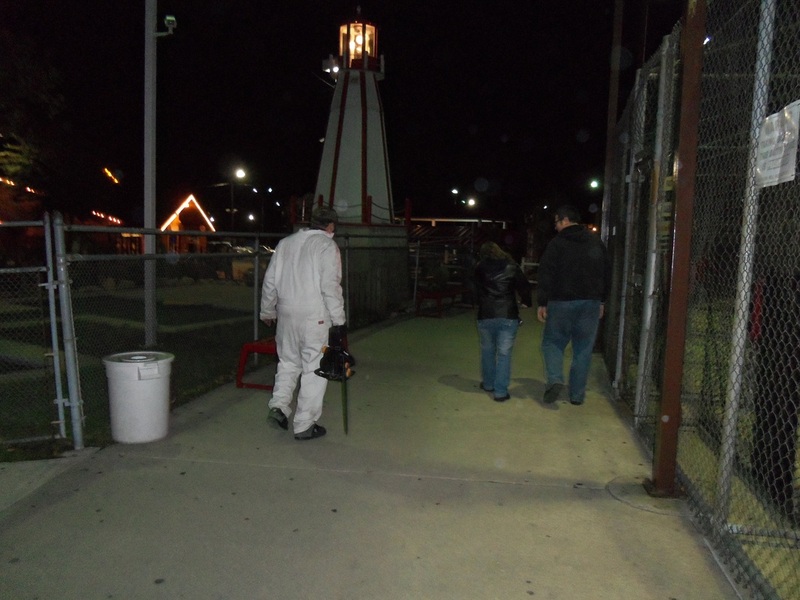 As the haunt is housed in a family fun center, right behind the batting cages, wandering through an empty maze while being able to hear the sounds of people practicing their batting (as well as the sounds of traffic passing by) did not make for a scary experience. If there had been some nice props or scenes within the expanded portion that would have been good enough. However, as it was, it was quite dull,and had me walking faster just to get it overwith. There were only about 5 actors in the entire house, and only the very first one seemed to put much into the performance. The others simply jumped out once when you entered their room and then nothing after that. There were very few props to speak of. There were a couple of mirrors used to good effect as they made it seem like the way out was in front when it was in another direction. Overall, this haunt is simply TOO SHORT. Despite the "expansion", our entire visit to Sweet Dreams only lasted about 13-14 minutes, and that included the time it took to buy tickets, walk to and from the car and wait out in front of the haunt (the wait time was short). The question on all of our lips after our 2011 visit was "Was that it?" It was also the same question we asked after our 2012 visit. Given the hype, one might expect it to be on the level of some of the other houses in the same price range. Unfortunately, Sweet Dreams is a perfect example of the phrase "don't judge a book by its cover" - in this case there is much less here than the promotion would have you believe. This haunt should be in the $5-$7 range, and even then it still needs some more to it to make it worthwhile. We have been to Sweet Dreams closer to Halloween as well. Basically, there are more people waiting to get in, and sometimes there is some wait entertainment, but the inside remains the same. In short, Sweet Dreams has little to offer in the way of scares or even in the way of nice sets and/or displays, and unless that changes, I'd have to say that 2012 will probably be our last visit.